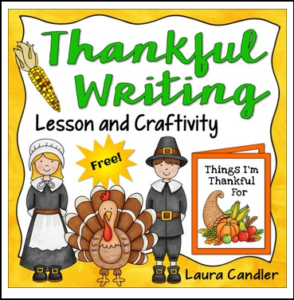 Thankful Writing is a lesson plan and a set of printables for teaching students to write a simple expository paper about the things they are thankful for. You’ll find directions for introducing this easy expository format, leading a brainstorming session, and working with students as they complete Thanksgiving essays. The best part is that they can glue their essays into a folder, decorate them, and share them with their families on Thanksgiving Day! This lesson is newly revised, but it’s still the same basic lesson. If you’ve used it before and like the updates, please leave feedback. Thanks!